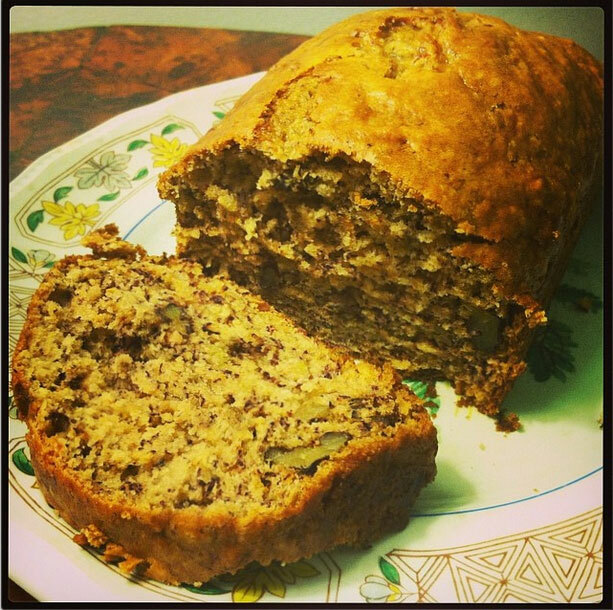 Banana bread brings back memories of childhood for Rosemary and me. We both remember having slices with butter as kids. Nowadays, banana bread is pretty easy to make vegan, and we found a delicious recipe for marbled banana bread in Isa Chandra Moskowitz’s newest cookbook, Isa Does It. In a large bowl, combine the mashed bananas with sugar, oil, milk, and vanilla, and whisk until smooth. Add the flour, baking soda, and salt, and gently mix until well combined. Fold in the chopped walnuts. Pour the batter into a lightly oiled 4″ x 8″ loaf pan. Bake for 55 minutes or until a butter knife inserted in the center comes out clean. (It might appear a little sticky, but as long as it is not coated in batter the bread is done.) Let cool on a cooling rack … if you can. Be sure to try some homemade vegan butter with your bread!